Well, it’s been quite a week. My first clue that I had maybe, perhaps, overcommitted myself just a tad should have been my “Happy Thursday” announcement on Wednesday’s post. And then skipping Thursday’s post altogether. Like I said, it’s been quite a week! There’s the relief of knowing that an entire weekend is stretched out in front of me, and there’s the satisfaction of knowing that I got a lot accomplished in the past five days. Overcommitted, schm-overcommitted! In addition to my trip to the dentist and a couple of other not-fun-but-necessary medical appointments, I’m happy to report that I actually learned something! Or am in the process of learning something, anyway. Oh, and I’ve already found my next project, and your It’s Finally Friday webclip, all rolled into one! 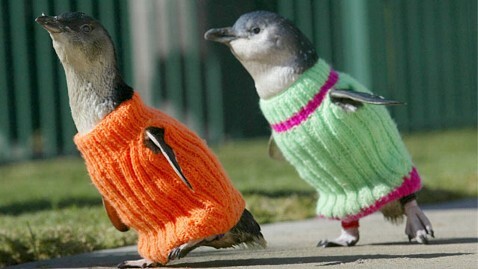 who would have thought penguins needed sweaters?? maybe there re polar bears out there in need of mitts?? apparently the sweaters keep them from nipping at their feathers and damaging them until the oil can be cleaned off properly! and don’t they look CUTE?! ?